Garages often serve both as homes for vehicles and as usable space for storage or as a workshop. Creating walls in a garage makes it more functional for a variety of uses. Both OSB and playwood are common sheathing materials suitable for use for garage walls. 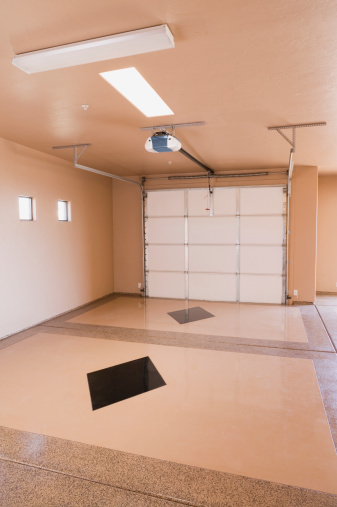 How your garage will be used will determine which is most appropriate for your needs. OSB and plywood can be left as is for a garage workshop. OSB is the acronym used for Oriented Strand Board. OSBs are wood panels used as an alternative to plywood because they cost less than plywood and have greater uniformity and stiffness. The boards are made of layers of wood strands coated with resin and wax, which are pressed together to form a panel. This gives OSB boards a smoother finish than plywood. The "oriented" part of the name applies to the look of final boards. The strands on each layer face the same direction. On the exterior surface, the strands are laid in the long direction; in the middle of the panel, the strands run at right angles to the long edge of the panel.. Boards are made with either square or tongue-and groove-edges, and range in thickness from 19/32 inch to 1 1/8 inch. The standard panel size is 4-by-8 feet. OSB is a effective sheathing material for garage walls. It's strong and durable, and it can be used as a base for nailing or stapling insulation to garage walls. OSB can be left uncovered for utilitarian bare-wall constructions, but can be primed and painted. A big advantage for using OSB in garages is that it's possible to drive nails through it for hanging items, such as racks, storage systems and carpentry, auto care and landscaping equipment. Plywood is an engineered composite wood material made from thin sheets of wood veneer, or plies. The veneers are formed into layers and glued together. Unlike OSB, which has vertical threads, plywood is slanted at right angles. This gives the panels greater strength. The plies are glued together with adhesives and resins and bonded together using heat and pressure. This makes plywood structurally stable, with minimal tendencies to warp, crack, shrink or twist. Plywood is a good material for walls if having an inconsistent look on the surface of the walls is not a concern. Like OSB, plywood can be used as sheathing for installation, or it can be left exposed. It's possible to attach drywall to plywood to create finished walls, and plywood is sturdy enough to take nails for tacking up tools and racks. However, plywood is more likely to splinter than OSB, and if painted the final texture of the wall will be uneven, and knots from the plies will be visible. Either OSB or plywood is fine if you just want walls for your garage without much in the way of cosmetic bells and whistles. OSB has a smoother and more consistent finished surface, and a painted OSB wall will have a smoother look than a painted plywood wall. Plywood is more moisture-resistant than OSB, and can be a better choice if you live in a humid climate or if your garage is underground and prone to retain moisture and humidity. OSB is less expensive than plywood.